NEW BY SPIEL DIREKT EG! After the tragic events of last year, named by the survivors "Bloody Nights", vampires have come back trying to repeat the human buffet. However, this time humans have been warned and they have backup. Which side will you choose when things get ugly? More Bloody Nights is a semi-cooperative card game for 2-6 players in which each player becomes an inhabitant of a village where there is no sunlight for 30 days. Each player must try to survive the vampires attacks, rescuing other survivors, arming themselves for self-defence and searching for hinding places and supplies. But careful! Any false move can cause you to turn into a vampire and betray your friends. 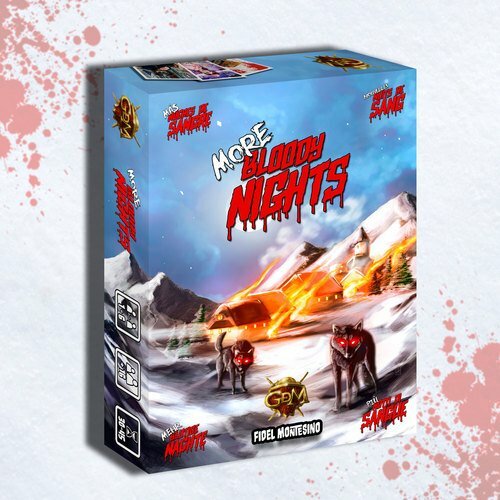 More Bloody Nights is a stand alone expansion for Bloody Nights: Combine them to play a bigger adventure!